Ask just about any gardener what he or she hates most about gardening, and the answer you're likely to get will be "digging up weeds!" A prime concern for controlling weed problems in the long term is not allowing them to go to seed! Off with their heads! Mow, string-trim, scythe, or hire goats—just get them cut down to size before any flowers open. One mowing won't kill weeds with perennial roots, and even some of the annuals will regrow and try to flower again, but mowing is better than nothing, and when you do it periodically the short regrowth becomes a living mulch that helps protects your soil from wind and water. Mown-weed living mulch works well under fruit trees and between raised beds. Adjust your mower as high as you can if mowing is all you plan to do: 4 to 6 inches is a good height. If you're planning to move on to the next weed-killing step, mow as close to the soil as conditions will allow. Bonus Tip: As long as it hasn't set seed, rake up the hay you just cut and use it as mulch elsewhere! (And when all else fails, there are some weeds that you can actually eat). 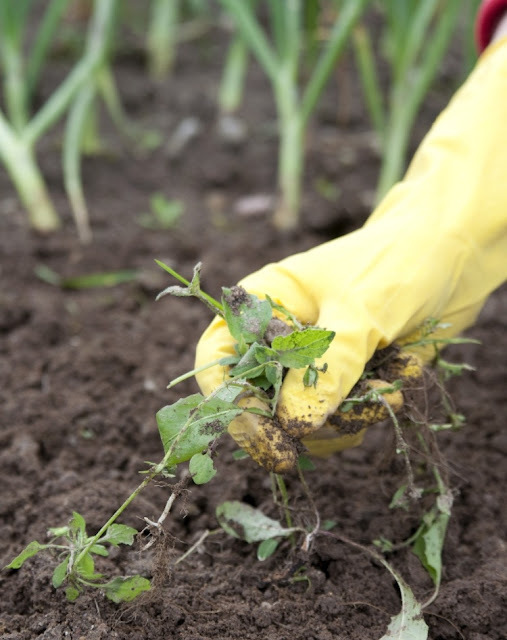 If you have any bare soil that gets sunlight and moisture, it will soon be home to sprouting weeds. The easiest way to prevent new weeds from sprouting from the many weed seeds sleeping in your soil is to keep the sun from hitting them and waking them up. Keeping the sun off older plants will also eventfully starve them to death (the more food they have stored underground, the longer the starvation takes—even years in some cases). 1. Mow existing weeds close to the ground or just pull the big ones and flatten the rest. 2. If you have a lot of large or perennial weeds, cover the entire area with many layers of newspaper or cardboard (remove any plastic tape, or as much as you can), overlapping sheets so there are no gaps. 3. Cover with 3 to 4 inches of organic mulch. In the veggie patch, I use straw, dried grass clippings, shredded fall leaves, the weeds I just pulled up—pretty much any sort of biodegradable material that will break down in a year or less is good. In beds with perennials and shrubs, I prefer a longer-lasting mulch, such as ground-up wood or bark. Bonus Tip: I don't recommend using solid plastic mulch or weed barrier, even under organic mulch, for a number of reasons: It doesn't let water through; eventually, it will break down and be a pain to remove; and lord knows what's in it! It almost always ends up in the landfill, too. Woven or non-woven permeable weed barrier cloth is slightly better, a good brand will last a really long time, and it lets water through. But don't think you can spread it and forget it. Over the months and years, the organic mulch will slowly break down, creating a nice layer of compost on top of the barrier. Weed seeds will germinate, and a few of their tiny roots will insinuate themselves through the barrier. Fast-forward a few years and you now have an amazingly resistant mat of weeds, firmly imbedded in the barrier, and rooted right through it—ugh! (Yup, I speak from personal experience). If you feel you must use a weed barrier, commit to scraping off the decomposing mulch that accumulates on top of it every year or so, perhaps even taking the cloth up and re-laying it, and replacing the mulch. Or just stick with organic mulch and save yourself a lot of trouble. So what about all those annoying weeds that pop up in places you can't mow or mulch, such as in narrow cracks in your sidewalk or patio or intertwined with your perennials' or shrubs' roots. Or weeds with huge underground networks and storehouse of food that just keep coming back. And back. And back…. And—gasp—what about poison ivy? Here are some options: In general, they all work best on young, rapidly growing plants and leaves. And they all kill the plants you like just as effectively as the plants you don't like, so you have to be selective when applying them. If you have just a few cracks to deal with, just boil water in your tea kettle and pour a scalding stream along the crack to cook the roots. The weeds should be dead by the next day. For larger areas, you may want to consider getting a special propane torch with a long handle called a flamer or a weed torch. No, you aren't going to burn the weeds (and if they are dry enough to burn you shouldn't even be thinking of firing up this tool); but waved over short green weeds for just long enough to cook them, a flame weeder is an amazing tool for keeping cracks, and even permanent fence lines, weed free. 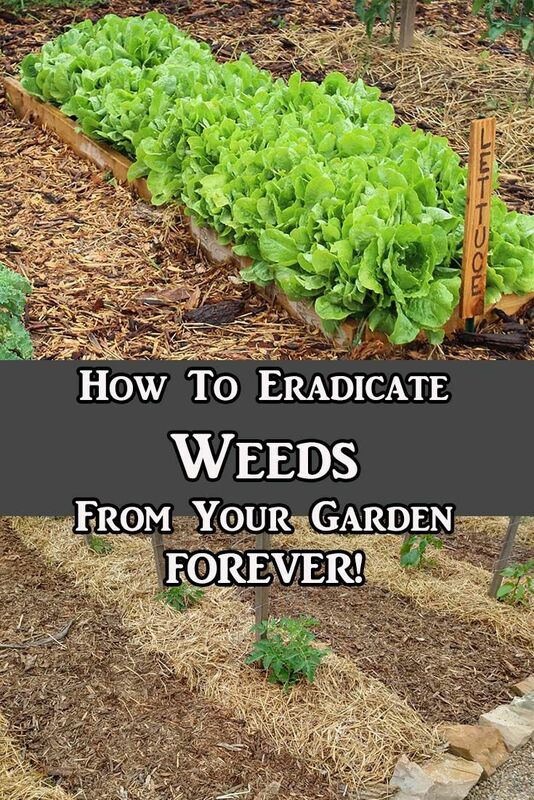 Weeds wilt and die within hours. Weed Dragon torches are popular amongst gardeners. No, this isn't an oxymoron. In the past few decades, an increasing number of commercial products have been developed that kill plants on contact but are pretty much harmless once applied. Unlike the strongest and most notorious synthetic herbicides, these organic sprays are not taken up by the plant and are natural substances that break down rapidly in the environment. This does NOT, however, mean you can't hurt yourself with them in concentrated form. Read and follow all label cautions! Some of the active ingredients in organic herbicide include clove oil, citric acid, acetic acid (usually as strong as 20 percent—far stronger than the 5 percent acetic acid in household vinegar), d-limonene (citrus oil), and fatty acid salts (modified soaps). Bonus Tip: Household vinegar may work as a mild herbicide on young plants and is pretty much harmless once applied. I've seen some online recipes that combine table salt with vinegar and a few drops of soap to help the mixture stick; these are more problematic as the salt will stick around and effect plants for many years to come, and not just those that sprout right there, but any whose roots wander that way, as well. Not a good idea, in my book. As of this writing, you may not find many (or any) organic herbicide options at your local garden store. Also, products come and go as the research progresses or business plans fail, so they may at some point become no longer available. But here are some mail-order/online business I trust and some of the products they currently stock. Bonus Tip: When considering a product not listed below, look for the term "OMRI Listed" on the label, which signifies the Organic Materials Review Institute has approved its organic status.